The Configuration View enables you to customize the data displayed on the Query Analyzer view. 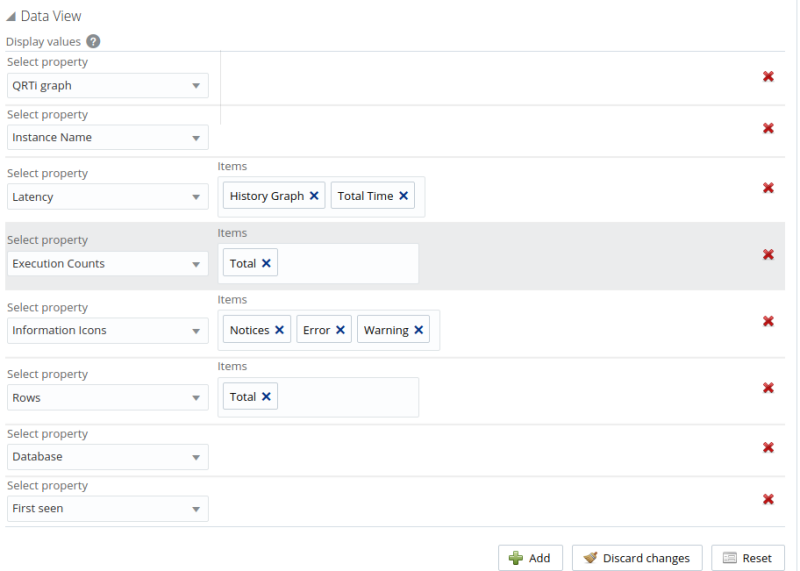 Enables you to select the graphs displayed on the Query Analyzer view and the time range of the selected graphs. To select a time range for the graphs, select a value from the Zoom section. Possible values range from one hour to two days. To select one or more graphs to display on the Query Analyzer view, click in the Graph selection box and select the required graphs from the available options. Column: enables you to filter the queries based on specific values within any of the columns shown in the Query Analyzer report list. To use the column filters, you must specify the Column that you want to filter on, the Operator to use when performing the comparison and the Value that you want to compare. For example, to filter on all queries that return more than 100 rows on average, set the Column to Average Rows, the Operator to >=, and the Value to 100. Database: limits the queries to those executed within a specific database. The database match is performed using the LIKE match from the MySQL database, hence you can use the % and _ characters to multiple and single character matches. For more information, see Pattern Matching. Notices: Filters on the notices, enabling you to filter the list to show only the queries that did not raise a notice, indicated a full table scan, or indicated that a bad index was used. Statement Text and Value support text searching of the normalized query. For the search type you can specify either a basic text match (Contains), or a regular expression match (Regex). In addition to the basic text match, you can also search for a query that does not contain a particular string. For regular expression searches, you can specify whether the regular expression should match, or not match (negative regexp) the queries. Regular expressions are parsed using the standard MySQL REGEXP() function. For more information, see Regular Expressions. The search is performed against the canonical version of the query. You cannot search against specific text or values within the parameters of the query itself. Statement Type: Limits the search to statements of a particular type (SELECT, LITERAL, etc.). The Time From/To: enables you to select a time range for filtering. Only queries executed within the displayed time period are displayed, using the Hours and Minutes pop-up), or whether the selection should be based on a time period (From/To). Using this property you can display only the queries executed during a specific time span, and you can display the query history for a much longer time period, for as long as you have been recording query analysis information. It is not possible to use both Time Interval and Time From\To together. You must use one or the other. Time Interval: filters queries within the given time period from the point the graph was updated. For example, if you select 30 minutes, the queries displayed are those captured within the last 30 minutes. If you updated the display at 14:00, the queries displayed are those captured between 13:30 and 14:00. Possible values are between 15 minutes and 2 years. View: determines whether the information should be returned on a Group basis, where an aggregate of the same query executed on all monitored servers is shown, or on a Server basis, where queries are summarized by individual server. If the latter option is selected, the statements can be expanded to list the individual servers on which they were executed. The Sort view enables you to specify how the data is ordered in the Statements view. Errors: Highlights any specific issues experienced when running queries, including excessive table scans and bad index usage. These provide an immediate indication of a problem with a query that might require additional examination. Execution Counts: The number of times that the query has been executed. Instance: the name of the MySQL instance. Latency: The execution time for all the matching queries. This is the time, for every invocation of the corresponding query, as calculated by comparing the time when the query was submitted and when the results were returned by the server. Times are expressed in HH:MM:SS.MS (hours, minutes, seconds, and milliseconds). Latency Total: the cumulative execution time for all the executions of this query. Latency Maximum: the maximum execution time for an execution of this query. Latency Average: the average execution time for the execution of this query. Rows Total: The sum total number of rows returned by all executions of the query. Rows Average: The average number of rows returned by all executions of the query. Rows Examined: The average number of rows returned by all executions of the query. Select Type Full Join: number of joins performing table scans because they do not use indexes. Select Type Full Range Join: the number of joins using a range search on a reference table. Select Type Range: the number of joins using ranges on the first table. Select Type Range Check: the number of joins without keys that check for key usage after each row. Select Type Scan: the number of joins performing a full scan of the first table. Sorting Merge Passes: the number of merge passes the sort algorithm has performed. Sorting Range: the number of sorts performed using ranges. Sorting Rows: the number of sorted rows. Sorting Scan: the number of sorts performed by scanning the table. Statement: The normalized version of the query. Normalization removes the query-specific data so that different queries with different data parameters are identified as the same basic query. Temporary Tables Average: the average number of internal temporary tables created per occurrence of the statement. Temporary Tables Disk: the total number of internal, on-disk temporary tables created by occurrences of the statement. Temporary Tables Disk % : the percentage of internal in-memory temporary tables that were converted to on-disk tables. Time: the time at which the statements were executed. Warnings: the number of warnings generated by a statement. The Data View configures the elements displayed in the entries of the Statement view. Database: the name of the database on which the statement was executed. Execution Counts: the number of times the statement was executed. First Seen: the time and date the statement was first seen. Information Icons: select which information icons you want displayed on the statement view. These icons are displayed on the right-hand side of the statement. Possible choices are: Notices. Errors, or Warnings. Instance Name: the name of the MySQL instance. History Graph: adds a latency graph to the statement data. This graphs the latency high, low, and average history. Total Time: the total time taken by all executions of this statement. Maximum Time: the maximum time taken for an execution of this statement. Average Time: the average execution time for this statement. Lock Time: the time spent waiting for table locks caused by this statement. QRTi Graph: adds a Query Response Time index pie-chart to the left side of the statement. The pie-chart graphs the Optimal, Acceptable, and Unacceptable percentages for the statement. Total: the sum total of rows returned by executions of this statement. Examined: the total number of rows read by this statement. Average: the average number of rows returned by this statement. Full Join: the number of joins performing table scans because they do not use indexes. Full Range: the number of joins using a range search on a reference table. Range: the number of joins using ranges on the first table. Range Check: the number of joins without keys that check for key usage after each row. Scan: the number of joins performing a full scan of the first table. Merge Passes: the number of merge passes the sort algorithm has performed. Range: the number of sorts performed using ranges. Rows: the number of sorted rows. Scan: the number of sorts performed by scanning the table. Average: the average number of internal temporary tables created per occurrence of the statement. Disk: the total number of internal, on-disk temporary tables created by occurrences of the statement. Disk % : the percentage of internal in-memory temporary tables that were converted to on-disk tables. Filters can be created, or existing filters customized, in the Query Analyzer Configuration View.